Handlebar is the most important part of the project! To make it better than the factory one, it requires a complete adjusting of the handlebar and all controls. The goal is to reduce weight, improve ergonomics, maintain functionality and adapt the controls design to the motorcycle style. It is logical to install the clipons on the cafe racer, but there are also sports handlebars, such as the LSL AS1 handlebar. We chose LSL high offset clipons - the highest in the LSL line. The cafe racer is more of an urban sports bike than a racing one, so low clipons seemed to be too aggressive. LSL offset high is the most suitable option in our opinion: they provide a sporty, but not too low, ride. LSL clipons fit perfectly design and quality wise. They do not have a cut in the place of the tube fixing, which provides a bigger strength. The tubes are thick-walled, made of durable aluminum alloy with a kerf for fixing with a bolt, so the tube does not turn and does not move when dropped - this saves expensive controls. A standard dashboard with two carriers together with the original headlight looks great, but we installed a more compact LSL Clubman headlight and LSL brackets with holes for turn signals - this required replacing the dashboard with a lighter and smaller one. Motogadget on request of LSL produces ready-made sets of adapters and connectors specifically for Triumph Bonneville, so as not to redo standard wiring. 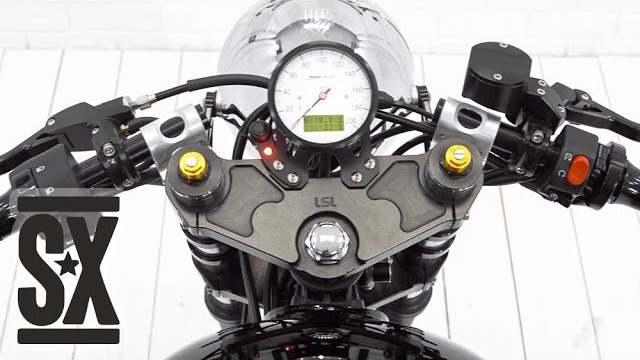 We chose a Motoscope Classic dashboard with an analog speedometer and digital tachometer, and all factory functionality. With its aluminum casing, it perfectly fit into the design. To properly line and secure the wiring under the tank, we had to braid three wires - there is enough space under the tank. The choice of the clutch machine is predetermined by the choice of the master cylinder. We have already assembled the front brake system in a separate video with an ABM brake claipers and master cylinder. ABM produces a milled clutch machine in the same style, so it makes sense to put them together. They look great on the handlebar. Both cars have bending levers and interchangeable tips, which saves them when falling. There is also an adjustment of the distance to the handlebar. The ABM clutch machine is equipped with a squeeze sensor - this is important for maintaining the concept of a factory motorcycle. ABM handles are a very smart solution when assembling a new control. They look great, have a dense anode coating and a rubber part with good traction. The left handle is fixed with struts, so it's easy to remove and install - this is useful because you have to rebuild everything several times. The throttle tube is integrated into the right handle. In the throttle tube set there were several rings for a different stroke length. For us it turned out to be very useful, because we put a new throttle machine case from Bonneville / Daytona / Speed ​​Tripple / Street Tripple models, but we didn’t find a tube for it. Cables for a new gas machine are better to take from the base model Triumph Bonneville. Standard consoles could not be left: they only fit the inch handlebar and with integrated gas and clutch machines. We decided to replace the left one with a Yamaha R6 03-04 remote control - it has the exact same set of buttons, it is black and relatively compact. New connectors had to be made to fit this remote control. We took the right panel from the Triumph Bonneville base model - it fits without problems and connects to a standard connector. The concept of the factory cafe racer requires the installation of mirrors. We chose LSL Round mirrors, which are mounted on 22 mm LSL clip-on weights. These compact classic mirrors fit perfectly into the design. Another option could be mirrors on the leg LSL Clubman, for which you need to mount the holders on the handlebar. The second option is probably more convenient, but also bigger in the way it looks. For Triumph Bonneville, round mirrors are perfect (they look good with the headlight, tank, dashboard, and engine covers), so we did not even consider other models. As a result, we got easier and more ergonomic control with factory functionality that fits perfectly into the design of the motorcycle!